We had a Church Meeting last night. For non-Baptists, this is the occasion when the gathered church seeks to discern what God wants us to do as a church. I have been in some bad Church Meetings. There are some where they have been dominated by one or two people and the rest of the church has not had the courage to confront them or disagree. I have been in others which have been unnecessarily long. Still others have spent an inordinate amount of time looking at trivial matters. 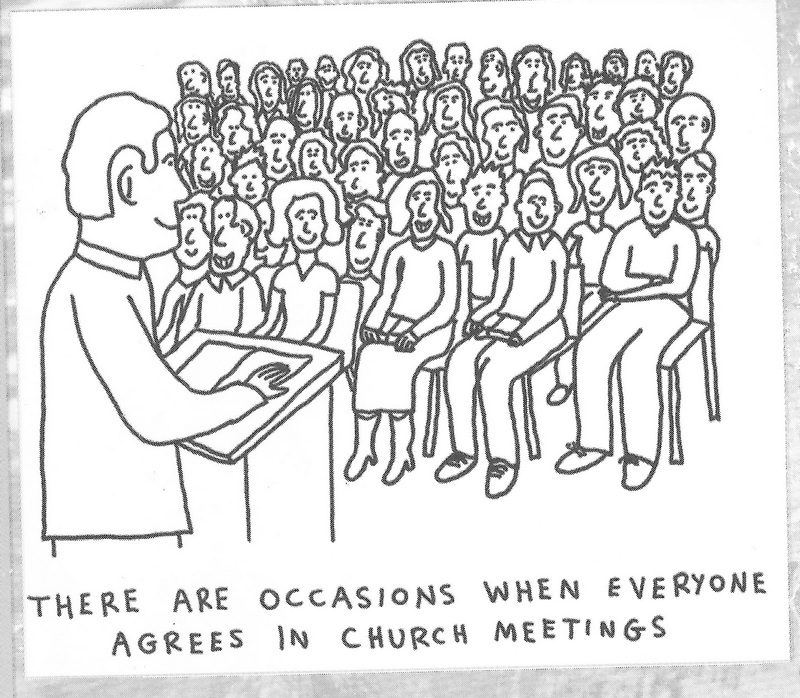 But for me the worst ones are those which have been a church equivalent of a shareholders meeting for a company. It has been business, business, business. I have not been in a meeting like any of those at this church. And last night I was really blessed and encouraged by the way that God’s people at Colchester Baptist Church considered and discerned together on some big questions. We got side-tracked a little on one occasion, but even then the track we went down was important. But we were open, honest, willing to listen to God speaking through each other and keen above all to know what he wanted for us rather than coming with our own agenda for him to ratify. It was a joy to chair such a meeting. And plenty more beside that. So I have to conclude that either I am making it more difficult than it should be, or perhaps that the answers are already there and I have no need to be looking for them. I love the phrase in Acts 15 in the letter written from the Council of Jerusalem to believers. They wrote, ‘It seemed good to the Holy Spirit and to us…’ That is brilliant. They used their brains to work out what seemed good to them and (my interpretation) had a sense of peace and assurance that this was the way ahead. It may well have been that the Spirit put the idea in their head to start with. There was an element of that last night in our meeting. But I think that often God has already given his answer (as in Isaiah 65, above). Much of God’s will for us is written in the Bible. I am not talking about Bible Bingo where you open the pages at random and stick your finger on a verse. But the 10 Commandments are part of God’s guidance for good living. The Sermon on the Mount has enhanced application and explanation of those principles for life. And so much more. In other words I think that often I want guidance on a specific issue and God is not so worried about the specifics if I am seeking to live by his values and principles. I don’t think he is too worried about which flavour coffee I buy, but he does want me to consider justice and the effect of my purchasing power on those who have grown the beans – hence I buy Fair Trade coffee. I don’t think he is too worried about the exact words I use when I speak to other people, but he does want me to be loving, to encourage people and build them up. I don’t think he is concerned about which football team* I support, but he does want me to ensure that I enjoy recreation and relaxation as part of my weekly routine. In the words of Alexandr Orlov: Simples! *Actually it is okay for me because I am supporting the oppressed and weak – Ipswich Town!